The contestant, an experienced lift truck operator, perfectly executed the course at a forklift rally. He was so excited, however, that at the end of his run he jumped off his machine, not taking care to make a three-point dismount. As a result, he lost points from judges and failed to win the competition. The three-point dismount, while often overlooked, is key to maintaining operator safety. 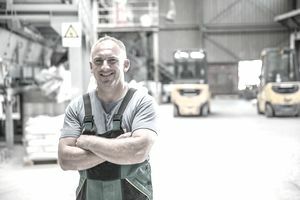 Continuing with our discussion of lift truck basics, this article looks at the importance of mounting and dismounting a forklift, as well as seat belt usage and what to do in the event of a tip over. It is important to understand that if a loaded forklift’s center of gravity moves outside the stability triangle, then a tip over could result. While skilled operators rarely encounter a tip over the situation, it is important that they are prepared for such a possibility. Operator slips on floor debris while still hanging onto the handhold with one hand, resulting in an upper-body injury. When mounting or dismounting a forklift, you must have three points of contact – either two feet and one hand, or two hands and one foot. It is exactly like climbing up or down a ladder. Remember to face the machine. Operators have a tendency to face away from the machine and hop or jump off, thus greatly increasing the risk of injury. Once aboard a counterbalanced forklift, the operator is required to wear a seatbelt. There is a litany of reasons why operators do not wear seat belts, such as that they have to get on and off far too often, or that in the event of a tip over, they could jump clear more quickly. The reality is that operators rarely jump clear more quickly. Tip-overs happen extreme rapidity and can be fatal if the operator is not wearing a seatbelt. Additionally, operators tend to think that a tip over situation simply would not happen for them. Operators do not anticipate a tip over until it is too late. Be prepared for the unexpected by wearing a seatbelt. If a rollover starts, don’t attempt to jump from the forklift. Brace your feet firmly on the floor and hold on tightly to the steering wheel. When a forklift tips, it happens with surprising immediacy. Only operators who have mastered these safety precautions will be able to react instinctively to protect their safety. Remember, most injuries or fatalities that occur as a result of a rollover result from the driver trying to jump clear from the machine. If a seat belt is installed in your forklift, OSHA requires that it must be worn. The information presented above is offered only for general information. Be sure to contact a safety professional to ensure that your forklift safety program meets or exceeds the requirements for your jurisdiction. Remember that each workplace is unique and will have its own site-specific risks which must be managed. To read more about lift truck safety, visit OSHA.